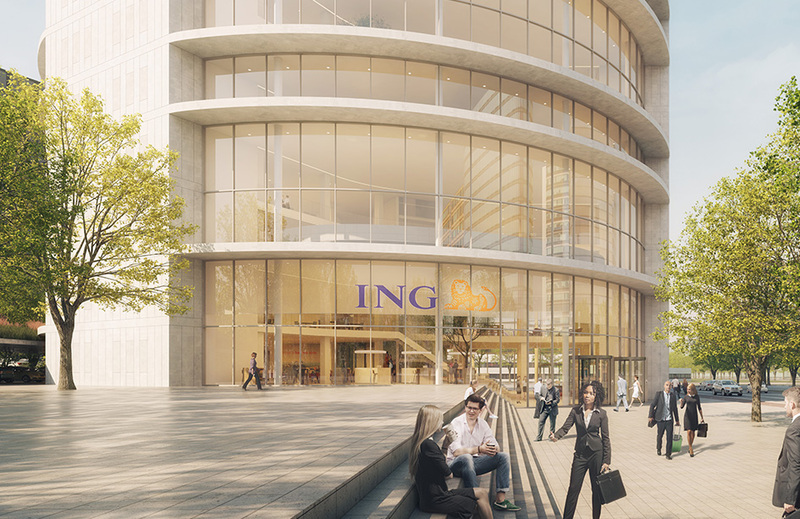 The 10.500m² office is located in the rapidly developing business district “Zuidas” in Amsterdam. 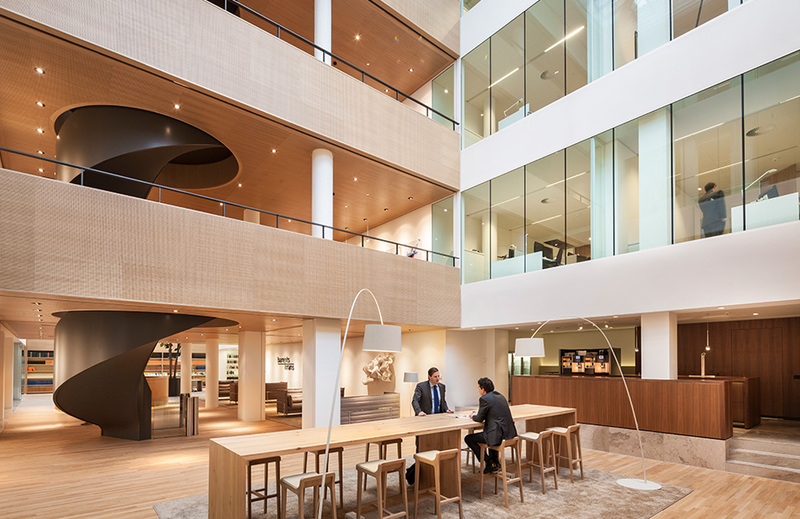 DLA Piper is the world’s largest law firm, with an Amsterdam based office consisting of 130 fee earners and a total 250 employees. The office is divided in a front and back office. The entrance, coffee bar, restaurant, waiting area, boardroom and meeting center are located in the front office on the ground level, mezzanine level and 1st level. 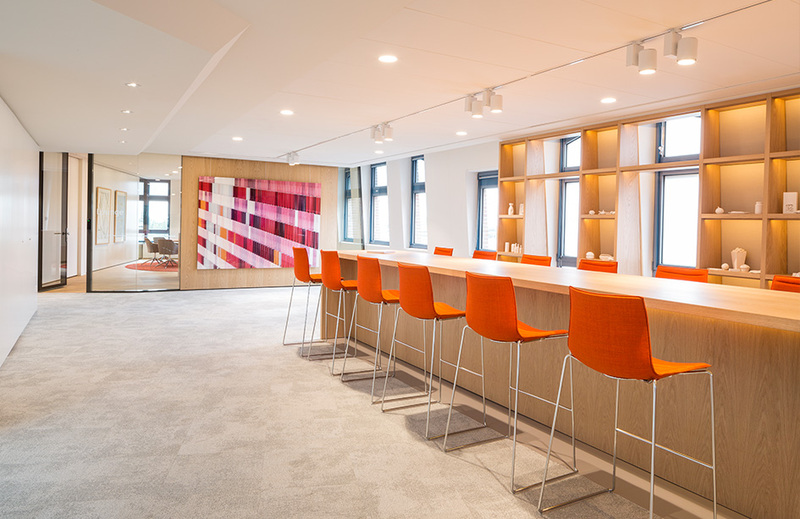 The back office is on the 2nd and 3rd level, with its working rooms, sharing spaces, bar and library. 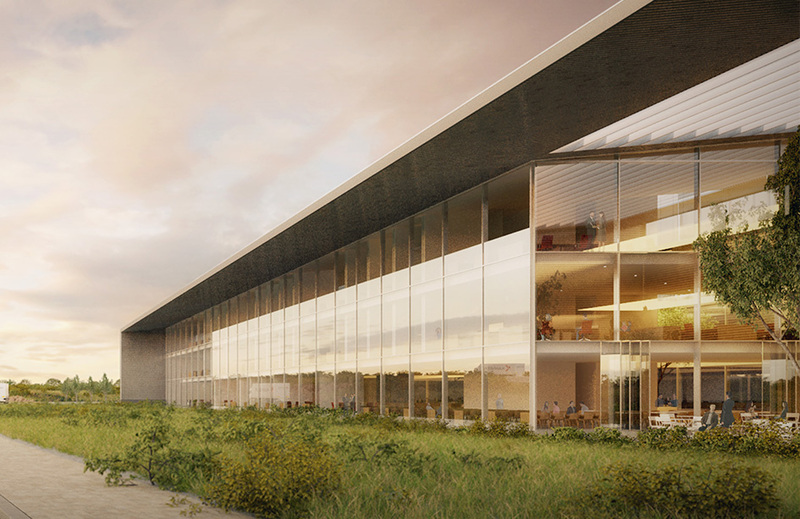 Crucial issue in the design strategy is the division of the building into two conceptual atmospheres. The colorful, fresh, modern and the natural, classic and sober. These atmospheres exist parallel to each other. The first one consist of vivid colors matched with simple, white forms. The second one uses softer colors and is made with natural materials such as wood. It has a more quiet character. This division establishes a clear distinction between the different programs and therefore offers diversity within the building. 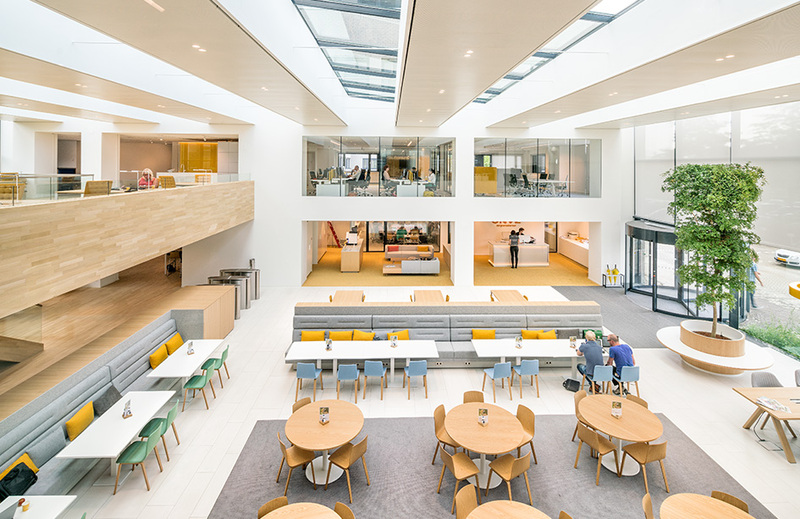 Hence, it creates a certain richness in materials and offers the possibility of a personal choice between various, contraceptive atmospheres in the working environment of DLA Piper. The front office is located on the ground level, the mezzanine level and the 1st level. 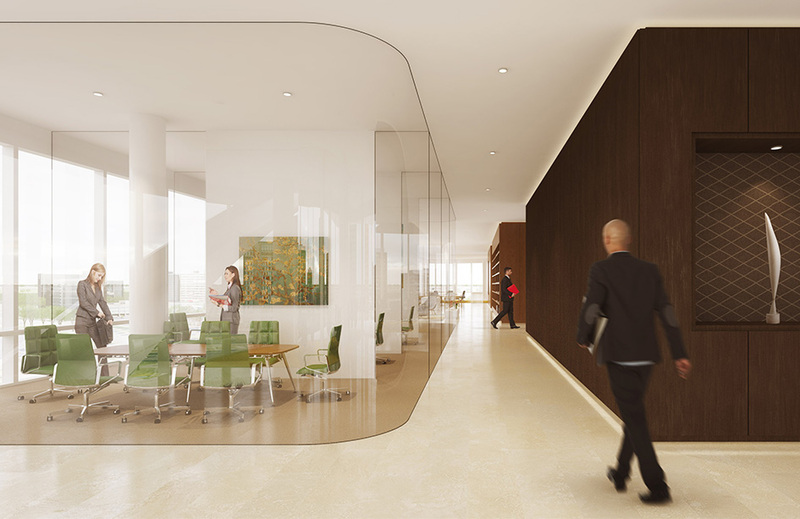 The first space one experiences when entering the DLA Piper office is the two-storey high entrance. Here, the welcome desk is moved from its previous position to the entrance zone. 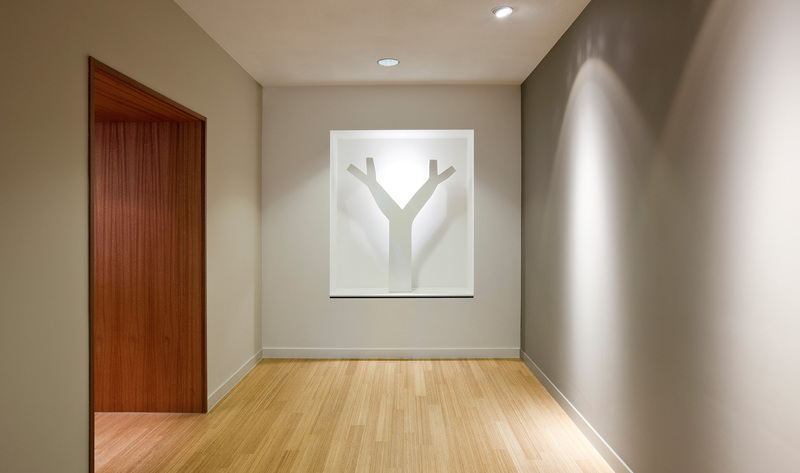 This object is a strong, basic shape made of Corian and is emphasized by the floor pattern. 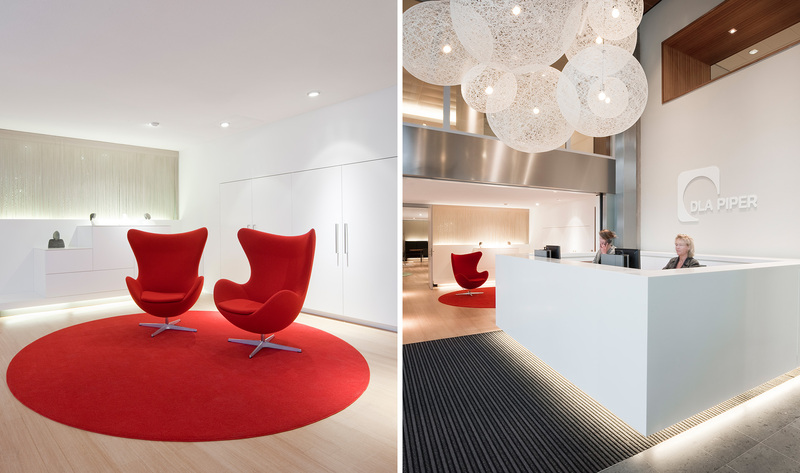 The monumental glass stairs going up in this space are highlighted by the expressive red carpet which lies underneath. Adjacent to the entrance the new coffee bar is created. This space mainly consists of a long, sculptural piece of white furniture placed against the wall, with a coffee machine, storage for cups, and presentation platform for art objects. This furniture creates the background for the natural wooden bar table and the island with lounge chairs which is placed on a red circular carpet. 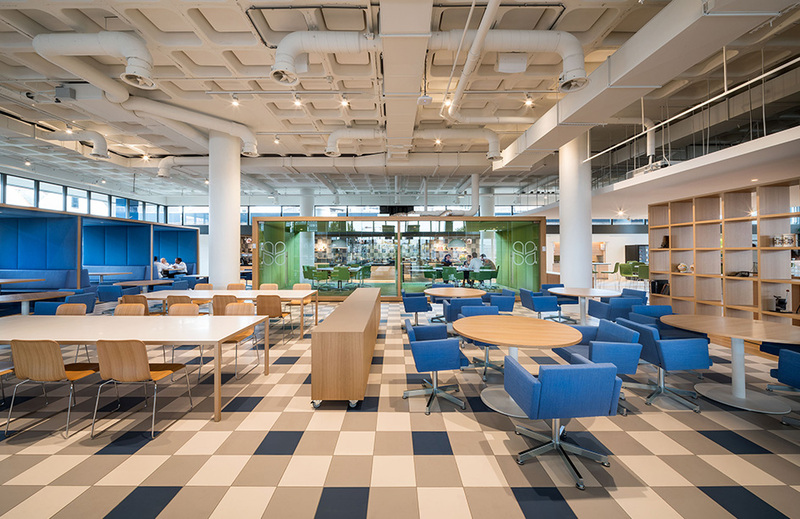 Next to the coffee bar is the restaurant, where natural and colorful areas are mixed and diverse types of seating occur: bench, table and bar table. 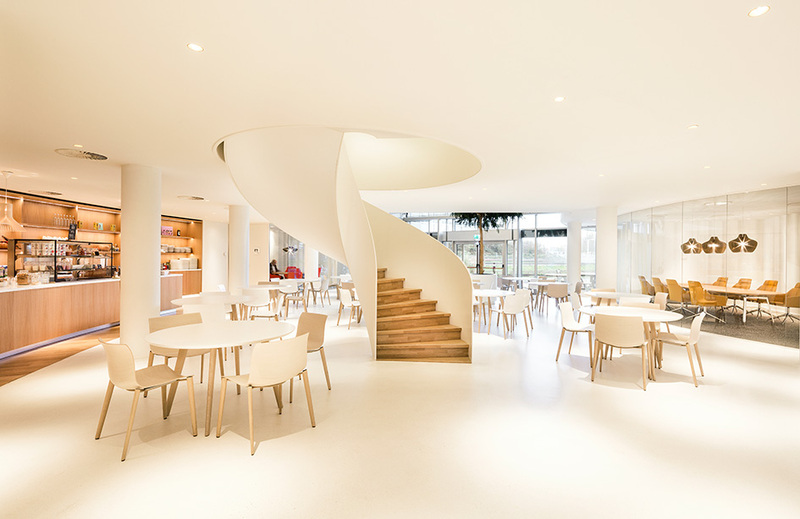 The floor plan of the restaurant allows easy rearrangement of the space in order to adapt to different types of use, for example conference or training sessions. Original floor and ceiling are left unchanged. Only the lighting plan was adjusted to support the flexible use. For better acoustics the walls have been upholstered and curtains are placed. 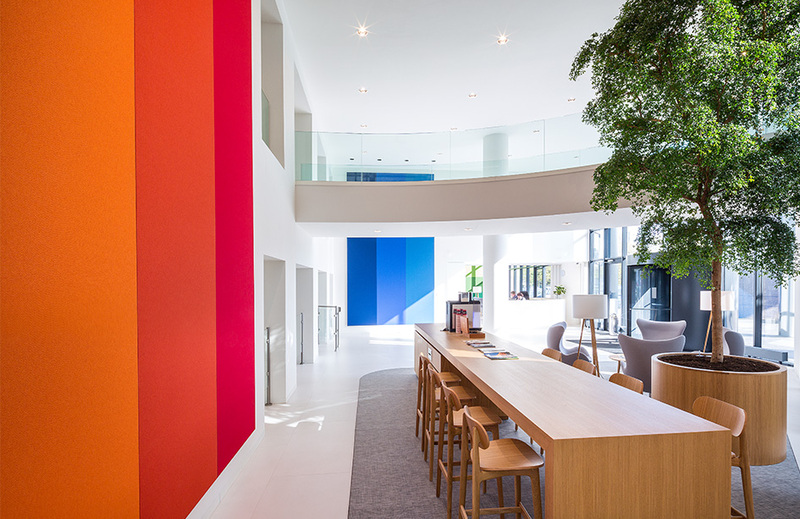 The mezzanine level consists of open areas (waiting area and lobby), having a natural character, and the contraceptive, colorful closed areas (boardroom, video conference room and working room). 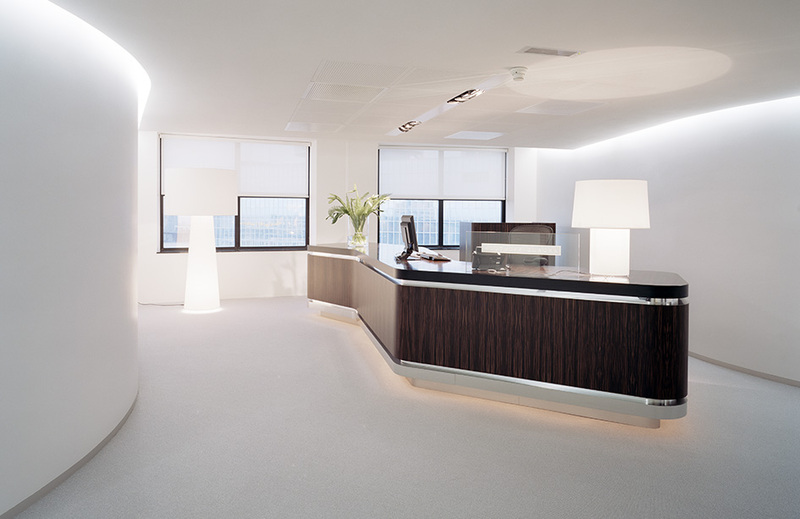 The position of the boardroom and the lobby is changed in order to optimize its light conditions and visual connections with other parts of the building interior. Through the glass walls of the lobby one can experience the vivid atmosphere of the boardroom as well as visually connect to the entry zone and the waiting area. 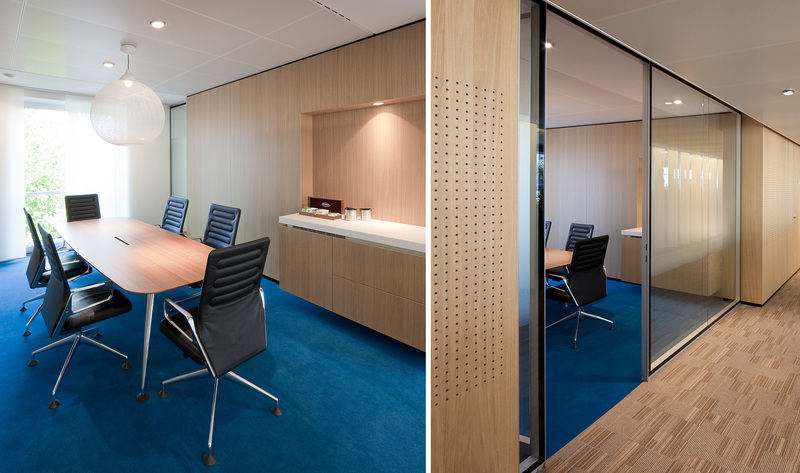 Prior to the redesign of HofmanDujardin, the boardroom was located only with its shorter side oriented to the exterior facade. The architects decided to rotate this room 90 degrees, so that now the long side of this room, which is around 15 meters is fully parallel to the facade. 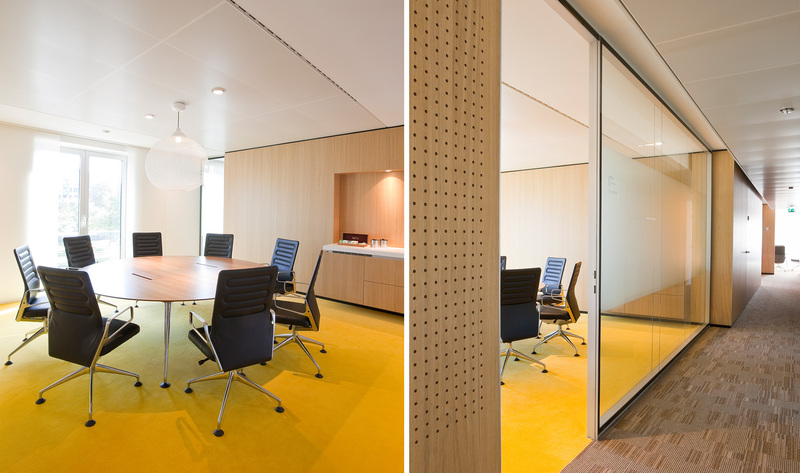 This alteration led to a substantial enhancement of daylight conditions in that space. The representative meeting center of DLA Piper is located on the 1st level. 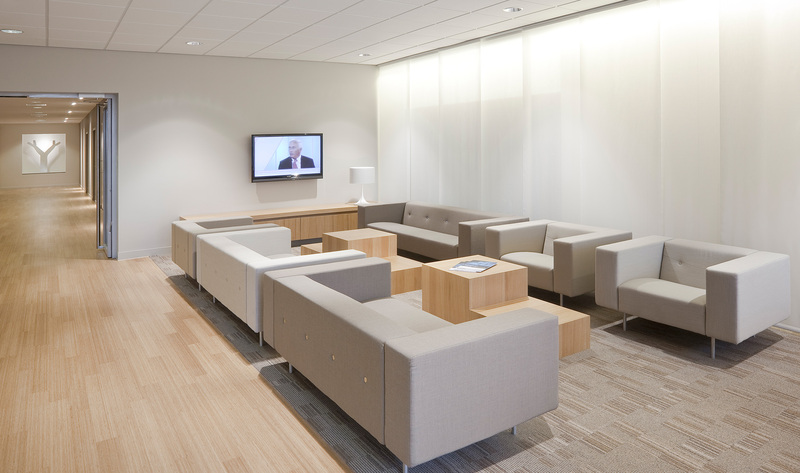 The sequence of open and closed meeting rooms is interrupted by the generous lounge area in the middle. This adds more space to the corridor and brings light to the inside. 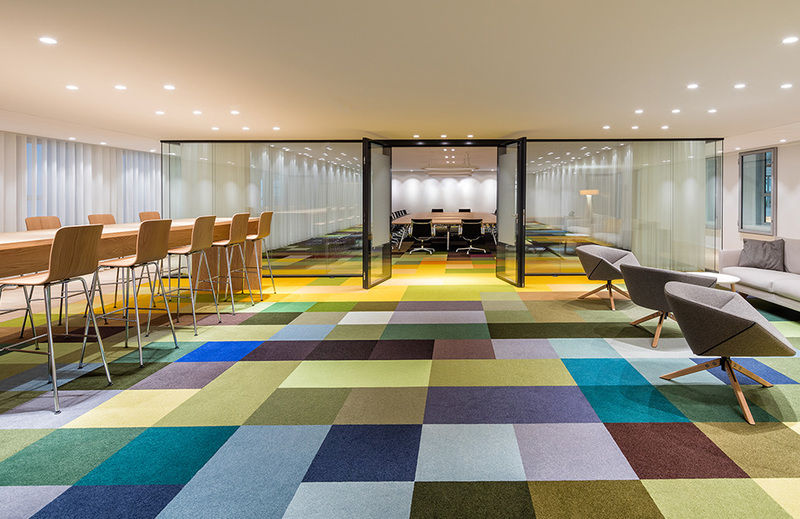 The corridor and the closed rooms are forming the natural zone, while the open meeting rooms create the multicolored, lively zone. The rooms have different colors, materials and sizes. 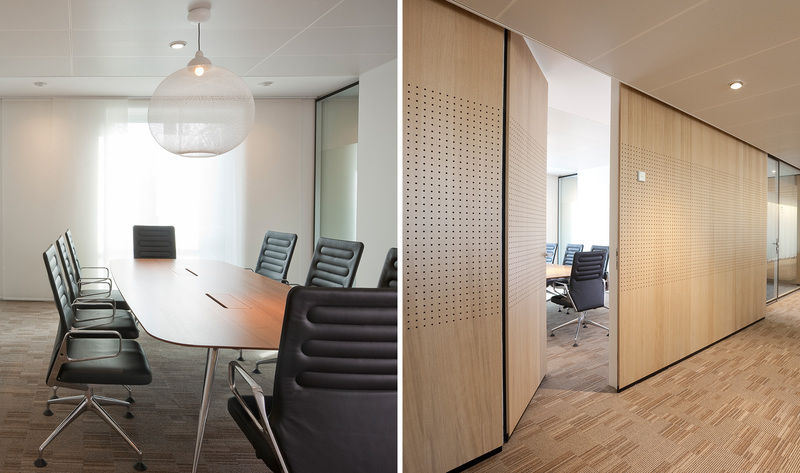 This allows one to choose a meeting room with an atmosphere that is in accordance with the character of the meeting: big or small, cosy or official, informal or strictly private. 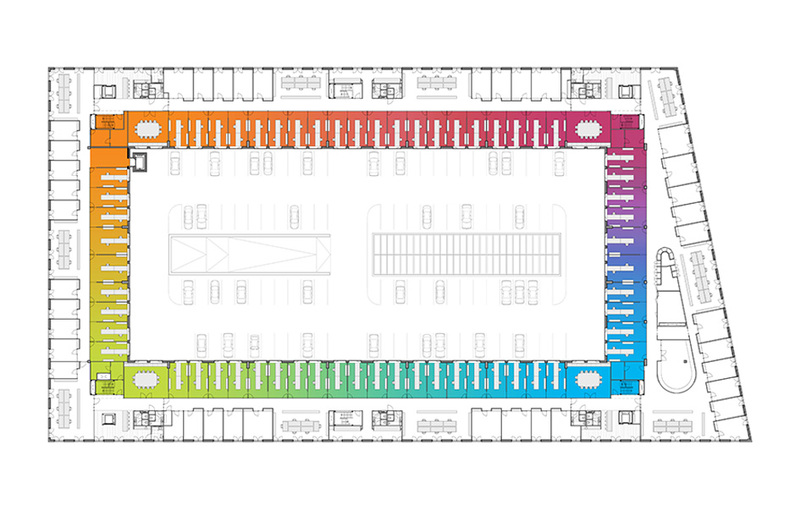 The back office, positioned on the 2nd and 3rd level, has a very strict zoning: the inner ring of working rooms creates the colorful zone, while the corridor and the outer ring establish the natural one. 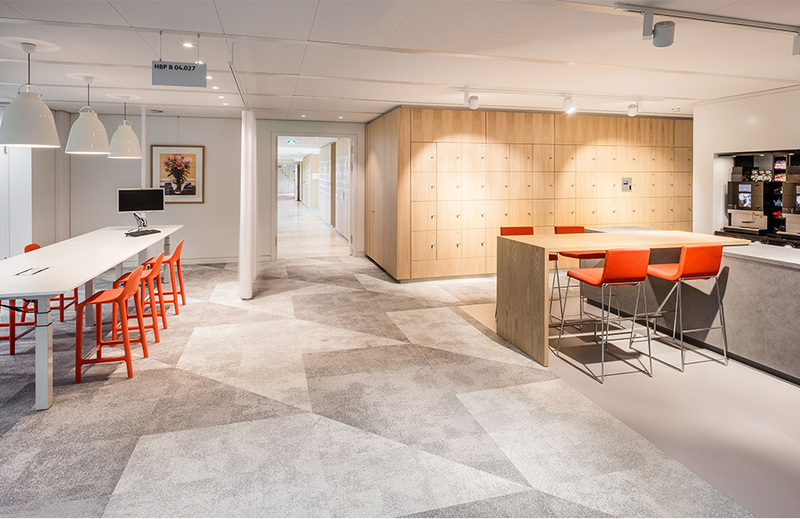 The employees are given a choice for their working environment according to their preferences: colorful modern or classic neutral. The most excessive spatial changes made to the existing situation can be found at the corners of the building. Not only were all closed rooms removed from here in order to gain more daylight and open up the space for the new working spots. 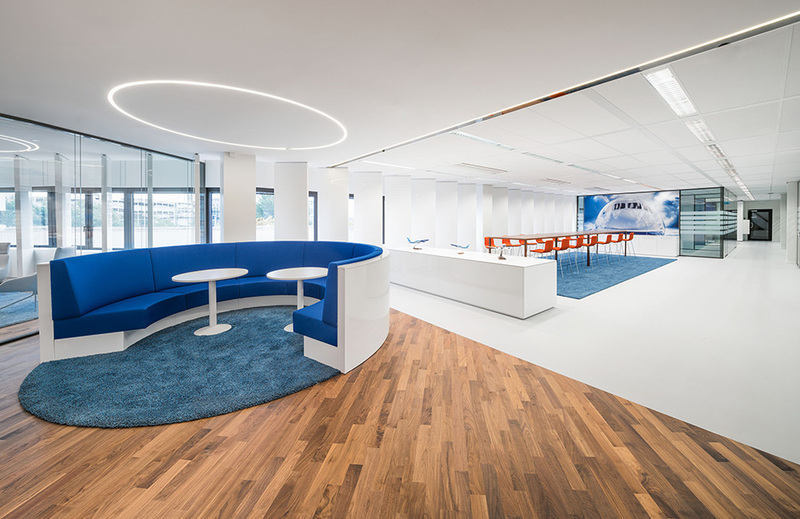 They also create the common areas, the so called “Sharing Spaces”. These parts of the building contain facilities such as internal meeting rooms, pantries, a small lounge area and restrooms. Each of these four corners has a color which is based on the movement of the sun. The warmer, sunny areas are compensated with blue and green, while the cooler, shaded areas have been enhanced with vivid colors like red and orange. 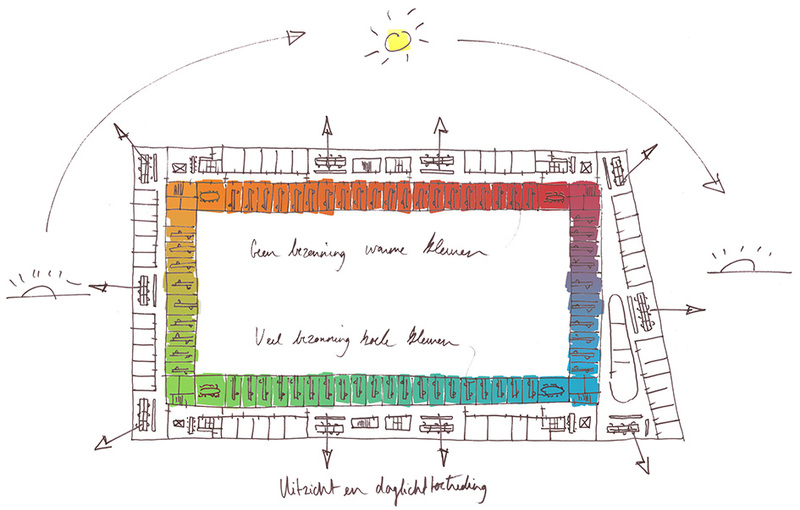 Because of the sun orientation, the warm colors are located on the north side of the building, and the cold colors are on the south side. The colors are slowly fading into each other. 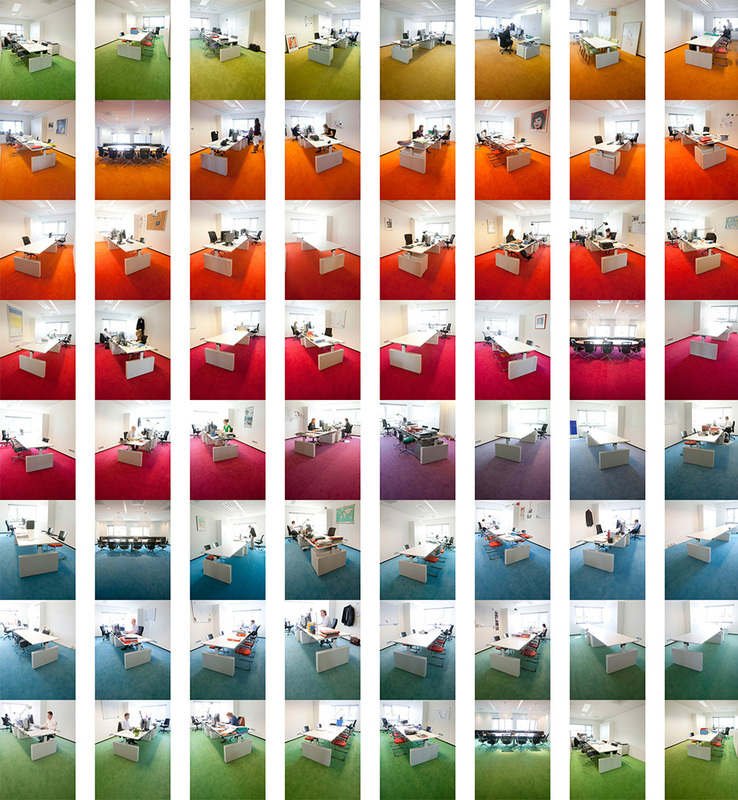 When one walks through the building this change creates an endless gradient throughout the entire floor: red becomes orange, orange becomes green, green becomes blue and blue turns back to red. 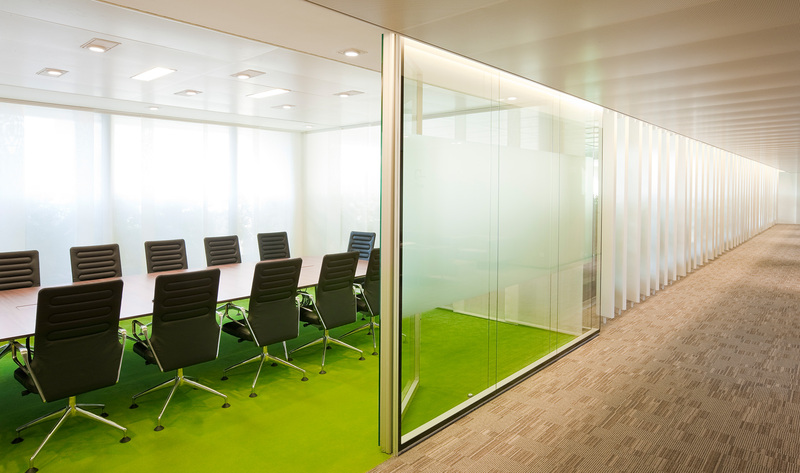 This improves the orientation and creates a colorful routing through the building. The middle parts of the corridor zones between the corners of the building, have also been opened. 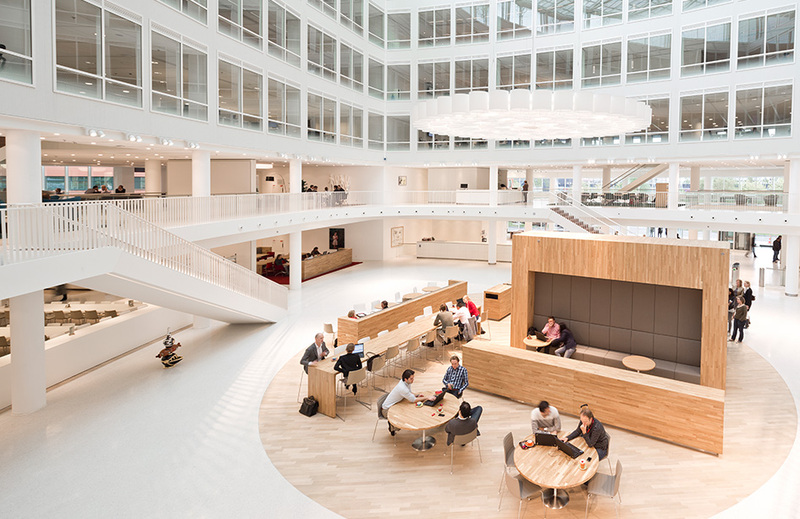 This means that the architects didn’t place any closed rooms here, but created open areas with new working spots in open space. As a result, the length of the corridor is broken and daylight brings a pleasant atmosphere inside. Being replaced from the mezzanine level, the office library is located on the 3rd floor. Located on the corner of the building, it offers generous space and a charming view to the surroundings. 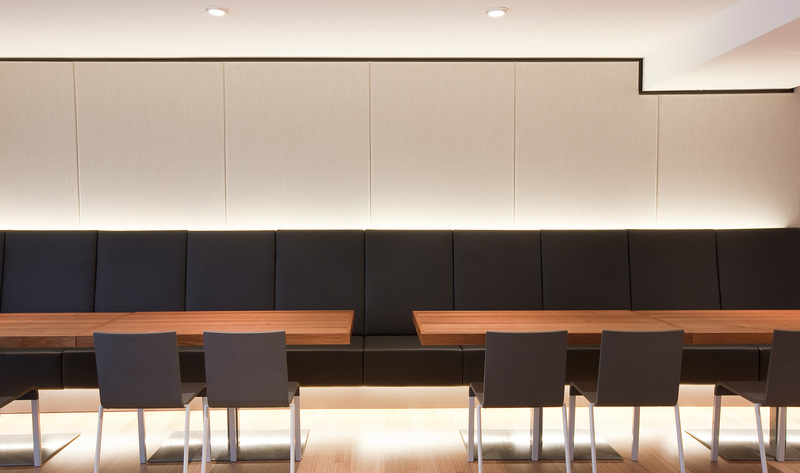 The new DLA Piper office interior design creates diversity, adventure and tranquility for its employees in thoroughly designed spaces that can stand the test of time.